Funny tongue in cheek post from MIND HACKS. Another great summary post from SHARP BRAINS. ISIR conference reminder. The 2008 annual International Society for Intelligence Research (ISIR) conference, Decatur, Ga, is December 11-13. Paper submissions are due Sept 1. Conference and hotel reservation information can be found here. The other day SharpBrains had a post on the importance of social-emotional learning in school learning. This post is consistent with the thrust of the Beyond IQ (A model of academic competence and motivation) project I've previously posted. Clearly there is more to intelligent "performance" than just intelligence. studies, that reading interventions can produce chants in the brain. The National Academies Press has just announced pre-publication access to Early Childhood Assessment: Why, What and How? Electronic and hard copy versions can be ordered now. In addition, if you don't mind reading pdf files on your computer, you can read the entire text for free on-line. A free copy of the Executive Summary is available (click here). Video games help your brain? Interesting post from SHARP BRAINS. Reviewer: James A. Moses, Jr.
Give them a try thanks to PSYCH CENTRAL. I'm pleased to announce that the following manuscript re: CHC (Cattell-Horn-Carroll ) theory and the Human Cognitive Abilities (HCA) project is now "in press" in the journal Intelligence. Readers may be particularly interested in the CHC Theory model figure (Figure 1) which represents the most comprehensive overview of contemporary CHC theory. McGrew, K. S. (in press). CHC Theory and the Human Cognitive Abilities Project: Standing on the Shoulders of the Giants of Psychometric Intelligence Research. Intelligence. As per the the Scholary Posting provision of the journals publication agreement, I've made a pre-publication copy of the submitted manuscript available at the HCA Archive web page (it can be found on the "HCA Project Communications and Announcements" branch). Back in 1997, I, together with Dawn Flanagan, Tim Keith and Mike Vanderwood, published our first g+specific--->achievement article in School Psychology Review. I recently searched high and low for a pdf copy of this article via the usual library sources but came up blank. I finally scanned a copy into a pdf file. A copy of this article can be viewed by clicking here. Included in that article was the figure to the right (double click to enlarge the figure). 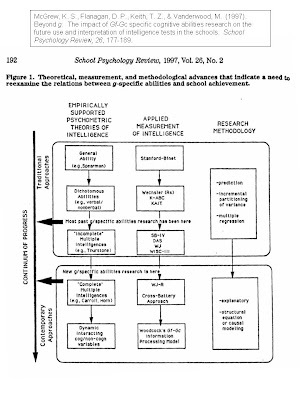 I've always liked this figure as it laid out the reasoning why the "just say no" (to intelligence test subtest analysis) research needed to be revisited in light of advances in: (a) theories of intelligence (CHC theory), (b) measurement of intelligence constructs (Gf-Gc or CHC-grounded batteries), and (c) statistical methodology (SEM vs multiple regression). The figure summarizes much of the introductory text in the 1997 article. Frankly, this publication is one of those for which I'm the most proud. Why? “The arguments were fairly convincing regarding the need to reconsider the specific versus general abilities conclusions. Clearly, some specific abilities appear to have potential for improving individual diagnoses. " (Reschly, 1997, p.238). Second, this "mother" study lead to a systematic program of g+specific abilities research that continues to suggest that certain broad/narrow CHC abilities are important in understanding reading and math achievement above and beyond the effect of g (general intelligence). A listing of articles that followed can be found by clicking here. Click here if you want to view all g+specific abilities posts that have been made at IQ's Corner. There are now a sufficient number of these studies, that when combined with CHC no-g model multiple regression studies, that I was able to recently complete the formative work on a research synthesis (CHC Cognitive-Achievement Correlates Meta-Analysis Project) of the collective findings (which I will eventually be summarizing in a manuscript). A review of all studies continue to support the "just say maybe" position. Enough said for now. I believe that a sufficient body of research evidence now exists that demonstrates there is more to understanding acquired knowledge acquisition and school achievement than g (general intelligence). When utilizing an appropriately valid and comprehensive model of intelligence (CHC theory) and appropriately designed and analyzed models, certain specific broad or narrow specific abilities are found to be important...and their effect sizes are not trivial. There is more to understanding school functioning than a simple full scale g-type score. Of course, if one does not believe in the construct of g (e.g., John Horn's adamant position), then narrow and broad CHC abilities are found to be even more important (as reflected in the non-g CHC organized multiple regression studies integrated in the above mentioned research synthesis). However, that is another post (or series of posts). Summer blogging, mobile blogging, push mobile blogging, etc. I need to apologize to my regular readers for not posting much in the way of creative and unique content this summer. I've simply been swamped with summer activities and major projects that are sucking up all my time (blogging done is my spare hobby time). In addition, since getting my iPhone, I've been experimenting with mobile blogging...with all posts coming directly from my little phone. 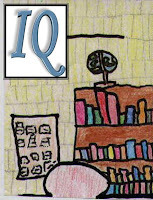 It is a personal blog called Mobile IQ. One thing folks may have noticed is that I've made more brief and somewhat messy FYI posts to my two major blogs (IQs Corner; the IQ Brain Clock). These posts have also come from my iPhone. Via the use of Mobile Bloglines, I get constant RSS feeds of stories at other interesting blogs. When I see something of interest, it only takes a few taps on my iPhone screen to send an FYI post to my major blog. It is very quick and sweet...actually quite amazing. Unfortunately, the downside is that the URL links come through in their full messy splendor...they are not neatly embedded in the text. But, the instant "push-to-my-major-blogs" speed outweighs the less-than-perfect neatness of regular posts. I could go in later (on my primary computer) and clean everything up....but that defeats the purpose of instant mobile push posts. Enough idle chatter. I'm hoping to start more regular posts very soon...possibly even toady. Your patience and continued patronage to my blog is much appreciated. I recently learned that this humble blog (IQ's Corner) was listed as one of the top 100 mental health and psychology blogs by Online University Reviews. I'm proud and pleased. New datasets: A number of new datasets (correlation matrices analyzed in Carroll's 1993 factor analysis meta-analysis) and original journal articles were added to the archive. Nine new correlation matrices were added to the archive. They are listed below. BACH01: Bachman, L.F. (1982). The trait structure of cloze test scores. TESOL Quarterly, 16, 61-70. BAIR01: Bair J.T. (1951). Factor analysis of clerical aptitude tests. Journal of Applied Psychology, 35, 245-249. BANN11: Bannatyne, A.D., Wichiarajote, P. (1969). Relationships between written spelling, motor functioning, and sequencing skills. Journal of Learning Disabilities, 2, 4-16. BECH01: Bechtold, H.P. (1947). Factorial study of perceptual speed. Unpublished Ph.D. thesis, University of Chicago. FLEI12: Fleishman, E.A., Hempel, W.E. Jr. (1954). Changes in factor structure of a complex psychomotor test as a function of practice. Psychometrika, 19, 239-252. FLEI51: Fleishman, J.J., Dusek, E.R. (1971). 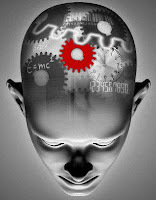 Reliability and learning factors associated with cognitive tests. Psychological Reports, 29, 523-530. FOGA00: Fogarty, G. (1987). Time sharing in relation to broad ability domains. Intelligence, 11, 207-231. GRIM01: Grimaldi, J., Loveless, E., Hennessy, J., Prior, J. (1971). Factor analysis of 1970-71 version of the Comparative Guidance and Placement Battery. Educational & Psychological Measurement, 31, 959-963. GING21: Singer, H. (1965). Validity of the Durrell-Sullivan Reading Capacity Test. Educational & Psychological Measurement, 25, 479-491. McGrew, K. (in press). CHC Theory and the Human Cognitive Abilities Projects: Standing on the Shoulders of the Giants of Psychometric Intelligence Research. Intelligence. blogs. Here is an example.